"Art is long and time is fleeting." My work with documentation graphics includes reports, speaker support, user manuals and guides.This virtually covers the full spectrum of my abilities: report covers, technical illustrations, organzational charts and assembly drawings. Documentation graphics is a staple in my industry and is the kind of work I love. 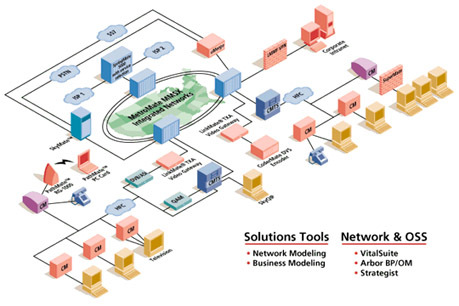 This diagram was used in a PowerPoint presentation and in an associated manual describing various applications and configurations of network features. It was created for a telecommunications corporation. This illustration was copied from a hand drawn piece of artwork that appeared in a technical magazine. I re-created it to see how well I could produce column width artwork for such publications. 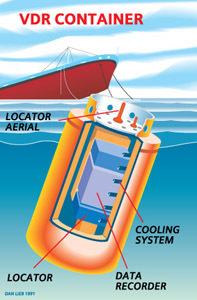 It depicts an emergency beacon deployed when a vessel is in distress. 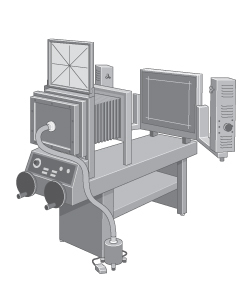 This illustration of an offset camera was used in documentation describing the equipment used in the reprographics industry. The full set of images had to work well in both online and printed pieces. This artwork is also a re-creation of a hand-drawn piece of artwork used in a medical publication. 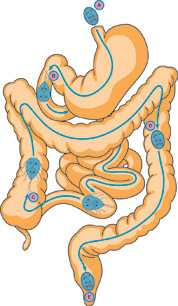 The artwork shows a parasite moving through an intestinal tract. I was applying for the job of a medical illustrator for a trade journal through a contractor. Although I did not get the job, the contractor commented on the artwork stating it was completely acceptable.